As an adult, the idea of wearing traditional metal braces can be a significant deterrent in seeking orthodontic treatment for misaligned bites or crooked teeth. Advances in modern dental appliances have made it possible to reap the benefits of straighter, more aligned teeth while preserving natural appearance. The most widely used form of cosmetic braces is Invisalign®. Dr. Silvera is a Century City Invisalign provider, with extensive orthodontic training and near a decade of experience, making him uniquely qualified to help patients with this braces alternative. Dr. Silvera and our whole team enjoy seeing patients achieve straighter smiles through discreet orthodontics. Invisalign is an orthodontic solution that uses a series of clear aligner trays. These are custom made for each patient and gradually move the teeth to the desired position. 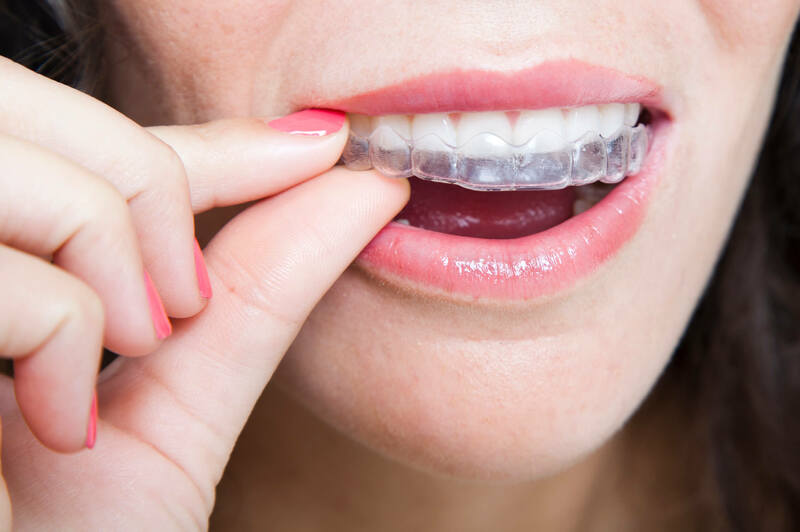 As they are clear, the aligners are nearly invisible when they are worn, and adhere to the smile so closely that they enhance patient comfort as much as possible. As one of the more modern orthodontic treatments available, Invisalign is continually improved upon, making it a viable option for patients with a wide range of alignment and occlusal issues. In fact, we can accomplish nearly everything with Invisalign as we can using traditional metal braces. To get started with Invisalign treatment, patients meet with Dr. Silvera for a consultation where their treatment plan is created after reviewing images of the jaw and teeth. Dr. Silvera discusses where your teeth are now and where you want them to be. Using the technology available, we are able to visualize what the end result will look like! When you’re ready to move forward with Invisalign treatment, we will provide Invisalign with the necessary information to make your series of custom alignment trays. For most people, 20-29 trays are needed to achieve the desired result. Patients get a new set of alignment trays every few weeks throughout treatment. While it takes a few weeks for some patients to adjust to their new appliances, most find Invisalign to be relatively comfortable and unobtrusive. The trays need to be removed during meals and when brushing and flossing your teeth, but this allows you to continue your regular oral hygiene routines and diets. Brushing and flossing must also occur after each meal to ensure your teeth are clean when the trays are worn. When compared to what’s required to clean your smile with metal braces, these additional steps are negligible. Ideal candidates for this treatment are committed to wearing the alignment trays for at least 22 hours every day and keeping their teeth clean to see ideal results. At the office of Richard Silvera, DDS, we strive to help our patients look and feel good through Invisalign treatment in Westside LA. All of our work is done with care. If you are interested in Invisalign, call our Century City dental office today.